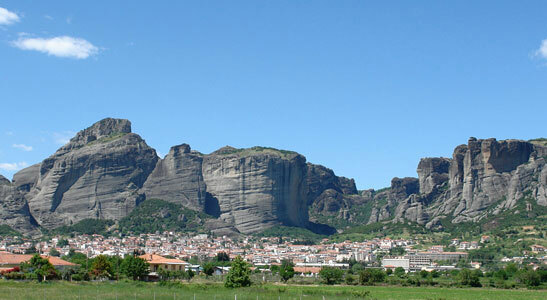 The Meteora rocks, above the city of Kalampaka, are an incredible phenomenon with no equivalent worldwide. 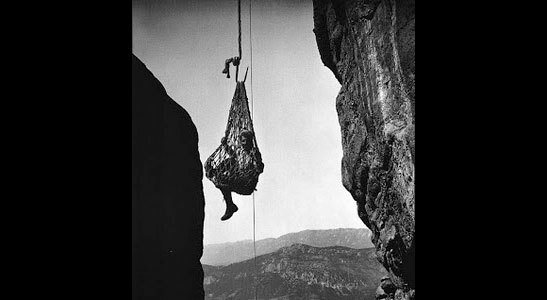 Many theories have been formulated concerning their formation. However, until today, there is no certain one. Upon these isolated rocks many monks and hermits have found shelter in order to isolate themselves and come spiritually closer to God. 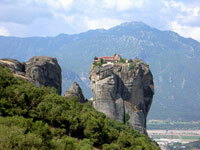 During the 10th century 24 monasteries existed from which only 6 remain today. 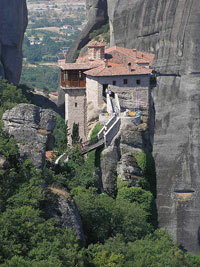 These monasteries with their elegant architecture create an unforgettable sight as they crown the immense rocks. 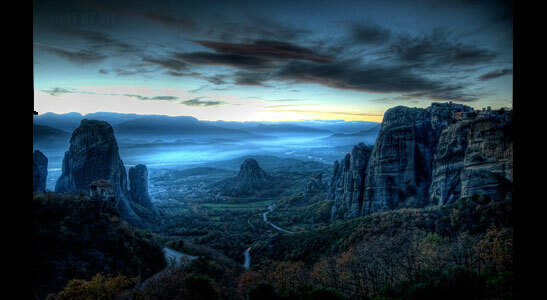 The Meteora have been nominated as a Monument of World Heritage by UNESCO. The Holy Monastery of Saint Stephen was originally a male monastery, but since 1961 it became a convent. Its founders are Saint Anthony, in the early and mid 15th century and Saint Philotheos, who, in the mid of the 16th century, rebuilt the church of Saint Stephen. It was during the 16th century, that the first frescos of the church were created. The present catholic was built in 1798 in the honor of Saint Charalambos, whose blessed relic is kept there as the most sacred and miraculous heirloom. 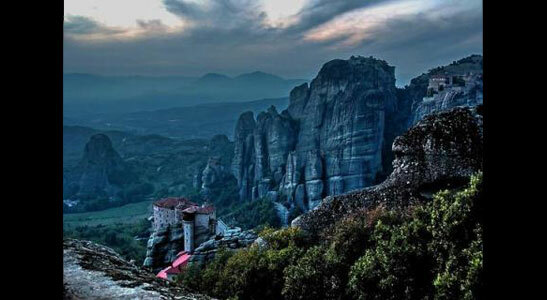 The Holy Monastery of the Holy Trinity is situated upon one of the most impressive rocks of the Meteora. Since 1362, it has been a fully functioning monastery. Its catholic was built in 1456-1476. Its frescos were created by two brothers, Anthony, a priest, and Nicolas in 1741. Its narthex has been enriched with frescos since 1692. The Holy Monastery of Rousano was initially a male monastery. Today it is a convent. It was built by its founders during the 14th or 15th century. The monastery’s present form is dated back to the 16th century. The catholic is dedicated to the Transfiguration of Jesus but also to the memory of Saint Barbara (4th of December). 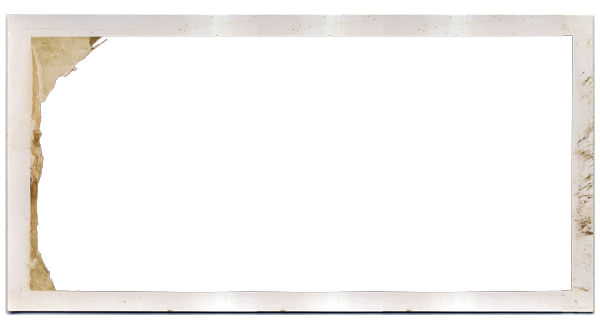 Its frescos are notable, though created by an unknown artist, which was influenced by the Cretan school. This monastery’s foundation dates early until mid 14th century. 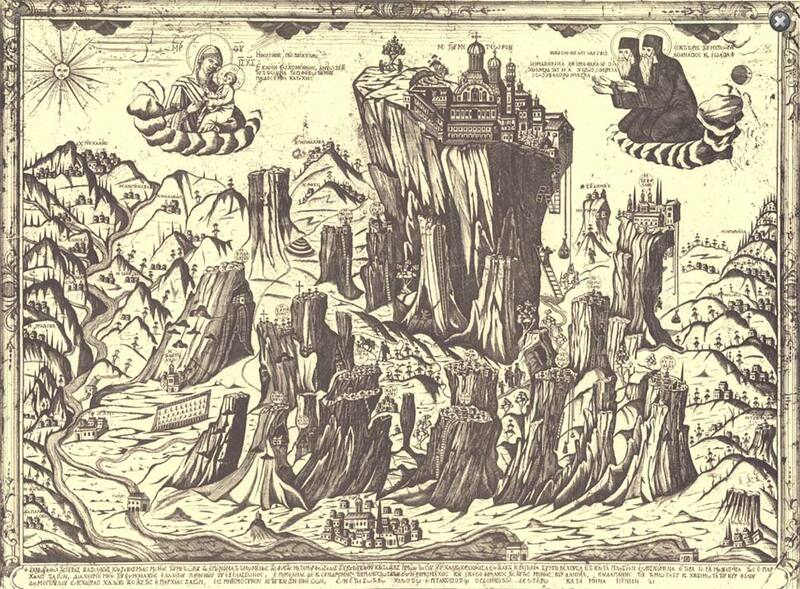 In 1527 the hagiography of the catholic was completed by Theofanis Strelitzas the Cretan, which is one of the most important hagiographers of Orthodoxy. On the frescos, one can distinguish perfection in the design of the figures and the excellent chromatic reproduction. 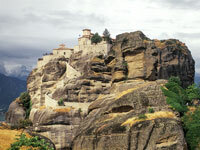 The Holy Monastery of Varlaam was founded by the hermit Varlaam in the mid of the 14th century. 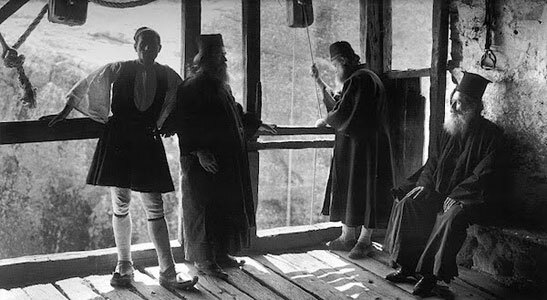 Later it was renovated by the brothers Theofanis and Nektarios Apsaras from Ioannina. This monastery’s catholic is dedicated to the memory of All Saints and was built in 1541-1544. Important buildings within the monastery area are: the Old Dining Hall (Trapeza), the Traditional Kitchen (Estia) and the Nursing Home (hospital). 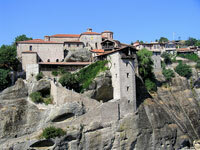 The Holy Monastery of the Transfiguration of Jesus was founded in the 14th century by Saint Athanasios the Meteorite. His successor and second founder of this monastery was the monk Saint Ioasaph, former “king” John Ouresis. The most important buildings within the monastery area are: the Traditional Kitchen (Estia), the Nursing Home, and the Formal Dining Hall (Trapeza). At the Holy Monastery of the Great Meteoro there is a remarkable and rich collection of religious manuscripts, holy icons and sacred heirlooms. The temple dedicated to the Assumption of the Virgin Mary is imposingly situated in the northern part of the city of Kalampaka. It was built over the ancient temple of Apollo. The artistically created marble pulpit and the “synthronon” are remains of an old Christian “basilica” church. The temple has undergone many reconstructions. In 1573 it was restored dramatically; at whole, wall- painted. This mid-Byzantine temple is dated around the 10th or 12th century. According to tradition, Saint Pachomious during the year 320 A.D. founded the first monastery in Thebes of Egypt with the help of Saint Anthony. It was in this monastery that he began to seek ways to help the monks concentrate during prayer and while enumerating blessings. According to tradition again, Archangel Gabriel visited Saint Pachomious in his sleep and instructed him on how to create an implement that would serve the needs of prayer. 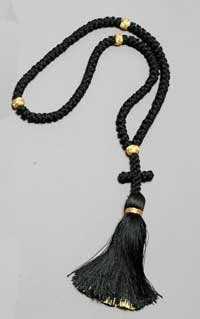 This implement was the Rosary. During prayer with a Rosary, which helps a lot in concentration, a specific technique is followed. The individual praying, says a specific blessing for every knot of the Rosary concerning the Glory of God.